- Publisher In Can Stress Heal?, Dr. Kenneth H. Cooper -- the leading international authority in preventative medicine, the "father of aerobics", and a believer in faith-based fitness -- provides the most comprehensive medically proven program yet devised for converting the pressures of life into significant health benefits. You will learn powerful "paradox prescriptions" for transforming bad stress into good stress, including: -- How accepting and embracing stress can often cause it to disappear. -- Why upsetting your body's balance through certain types of exercise can result in long-lasting improvements in health and energy. -- How letting go of your ambitions can help you achieve even more of your goals. -- How "retreating" from work can make you more productive. -- Why true spiritual serenity and inner strength emerge when life seems most unsettled. 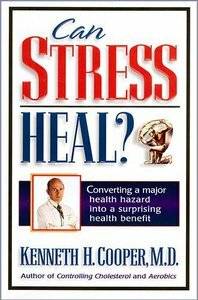 In Can Stress Heal?, Dr. Kenneth H. Cooper -- the leading international authority in preventative medicine, the "father of aerobics", and a believer in faith-based fitness -- provides the most comprehensive medically proven program yet devised for converting the pressures of life into significant health benefits. You will learn powerful "paradox prescriptions" for transforming bad stress into good stress, including: -- How accepting and embracing stress can often cause it to disappear. -- Why upsetting your body's balance through certain types of exercise can result in long-lasting improvements in health and energy. -- How letting go of your ambitions can help you achieve even more of your goals. -- How "retreating" from work can make you more productive. -- Why true spiritual serenity and inner strength emerge when life seems most unsettled.